JBL Bluetooth speakers always give high-quality sound experience. The JBL Flip 4 Bluetooth speaker has an IpX7 rating which means it is waterproof. The JBL Flip 4 looks identical to the JBL Flip 3 Bluetooth Speaker at a glance, but the JBL Flip 4 is little taller than the Flip 3. This JBl speaker is a next-generation speaker comes under JBL’s Flip series. The Bluetooth speaker is a cylindrical shaped Bluetooth speaker. This JBL Flip 4 measures 7 x 17.5 x 6.8 cm, and it is only 510 gm. It’s a premium Bluetooth speaker. The middle portion of the speaker has clothed texture, and the side is something like rubberized. At the top of the clothed surface, the buttons like Bluetooth pairing button, volume increasing-decreasing buttons, play buttons are placed. At the back of the buttons, one hook to strap a rope and hand the speaker has given. Besides the hole the power button, the charge status LED indicators, and JBL connects button is presented. There is a flip cover has given, and inside the cover, one micro USB port and AUX cable port has given. The JBL Flip 4 Bluetooth speaker rated IPx7 which means it is waterproof under 1meter water. It clearly defines you can easily take the speaker for pool parties. The JBL Flip 4 has two 8 watt speakers inside. It has JBL connect plus button. By the JBL Connect+ technology, you can wirelessly connect more than 100 JBL Connect+ feature speakers to amplify the listening experience. It enhances the party music experience. The Bluetooth speaker has inbuilt noise cancellation and echo cancellation microphone inside by which you can take crystal clear calls with the speaker. The Bluetooth 4.2 technology has used on the JBL Flip 4 Bluetooth speaker. It has a voice assistant also. With just a button press you can With a simple button press, you can activate and talk to Google or Apple assistant. The JBL Flip 4 Bluetooth speaker has a 3000 mAh Li-Ion battery inside which can give up to 12 hours of music playback time. 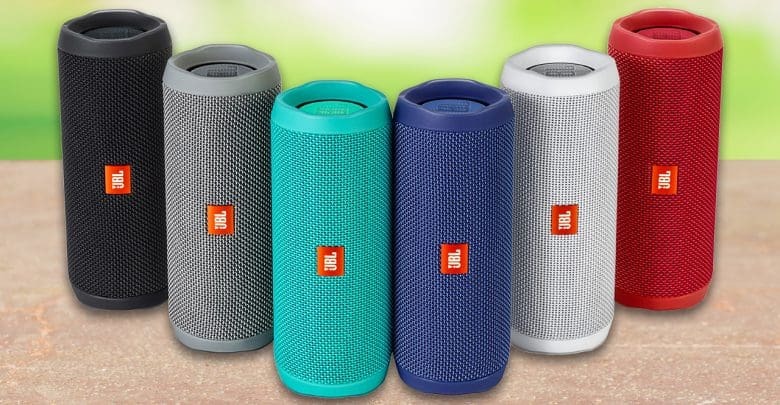 You get a wide range of color to pick up because JBL Flip 4 speaker comes in seven color variants; Black, Blue, Red, White, grey, Teal, and Squad. This JBL Bluetooth speaker price starts in Rs.7400. There you can see the varity in pricing according to the colors so you can check all the speakers and choose what can be perfect for you. For more detailed specifications you may visit JBL’s official website. Thanks for reading. Hope you have enjoyed. If you have any suggestions or want to say something, please comment below.